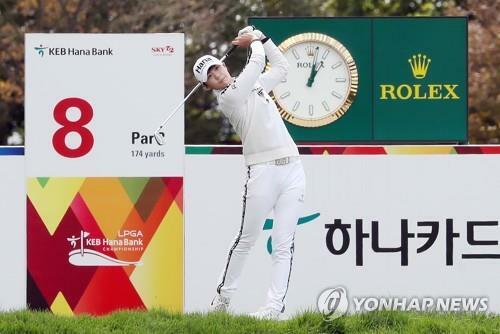 INCHEON, Oct. 11 (Yonhap) — Park Sung-hyun, world No. 1 in women’s golf, was enjoying a strong opening round at the LPGA KEB Hana Bank Championship on Thursday, when she ran into trouble at the penultimate hole. That double, along with a bogey at the second, were the only blemishes to Park’s round of four-under 68, which included seven birdies. Park is sitting three strokes behind the leader, Nasa Hataoka of Japan. And Park did get her shot back at the 18th, though she also needed some luck. Park pulled her tee shot way left and immediately pointed to left and yelled, “Fore!” But the ball bounced off the cart path and floated back on to the fairway, well ahead of her two playing partners, Ariya Jutanugarn and Brooke Henderson. Park is playing for second straight week in Incheon. Last week, she helped South Korea win its first title — the UL International Crown, the LPGA’s team match play competition.